Hoagies. Grinders. Subs. Heroes. Whatever you call them, these gigantic sandwiches are the perfect game day fuel. They can be made ahead of time, aren’t expensive, and — most importantly — feed a crowd! Let one of these large-format beauties inspire your Super Bowl fare. 1. 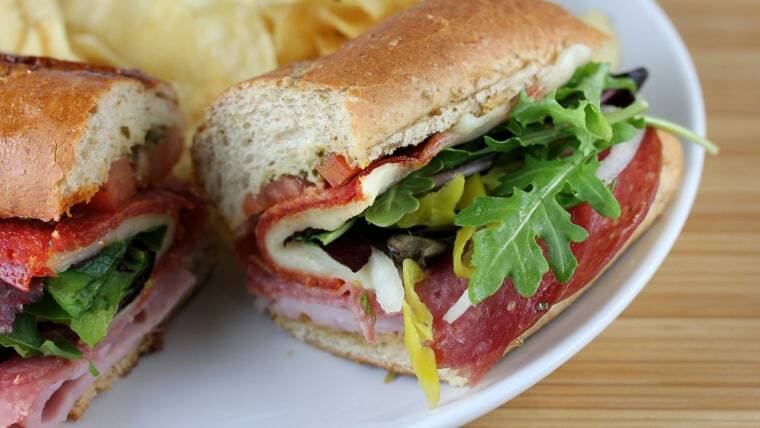 Classic Italian sub: Inspired by a Quiznos sandwich, this monster hoagie from Blog Chef is loaded with salami, ham, pepperoni, mozzarella, pesto and a whole garden full of veggies. Your guests may never use their frequent sandwich buyer cards again. 2. Saigon sub: In this spin on the classic Vietnamese banh mi sandwich from the blog Chin Deep, crusty baguettes are layered with cream cheese, shredded chicken, pâté, jalapeños, pickled vegetables and more. For another party food trick, serve the subs with shrimp chips instead of potato chips. 3. Meatball sub: To minimize party day prep, Iowa Girl Eats makes juicy turkey meatballs ahead of time, freezes them, then defrosts them the day of the big game. To serve, just pile the meatballs onto crusty rolls, slather with marinara sauce and mozzarella, and broil until the cheese is bubbly. 4. Huge hoagie: You might have to unhinge your jaw to take a bite out of this behemoth, but it’s worth it. Eat Drink Eat piles long, soft French rolls with turkey, three kinds of cheese, avocado, lettuce, tomatoes, sprouts, mayo and mustard. The result is sure to fill up a crowd — or a football team, if necessary. 5. Egg hoagie: Slept through your alarm clock? That’s no reason to skip breakfast! Take a cue from La Colombe coffee shop and make your crew omelet hoagies. A simple chive omelet laid on a long baguette spread with garlicky Boursin cheese and crunchy potato chips is a breakfast for the ages. These sandwiches would also be a great way to use up extra sandwich rolls the day after the game.